But if you don't come outside with me you'll miss the view! Just look at that wisteria reaching for the sunshine. Puffy clouds on a summer day. Spotted this butterfly from inside the house. I came outside to look at her and she didn't seem to mind. The pennywort is filling in very nicely in the path. Little baby frogs or toads jump all around here when you walk by. Do you remember studying about Pavlov's dogs? I just love a summer day! 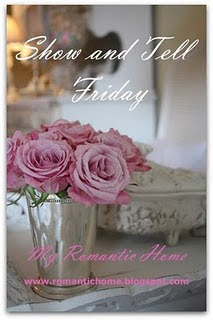 Linking to Show and Tell Friday at My Romantic Home. Please visit Cindy's beautiful blog to find a list of other participants. Your pond with the waterfall is just beautiful. Lots of pretty gold fish. Ours use to come up like that, but too many critters have scared them down deeper. I am so happy that I braved the heat to visit all of this beauty;)! Fish, frogs and butterflies. You've got such a cool wildlife habitat right in your own yard! Does your kitten go out by the pond? Said it once and I will say it again...Love that water feature! I am still dreaming that someday I will have one. Yes, we need some rain...I understand we are headed for even higher temps in the next few days.ugh-ugh! So pretty....I just adore the butterfly. Stacey, thanks so much for contacting Andrea. I finally thought to check your blog list....duh!! Ha. LOVELY LOVELY photos! We also have a garden pond and it brings us so much joy! Thanks for sharing at show and tell! What a beautiful garden you have. Terrific photos too. Wow, very pretty. I am hosting a Giveaway on my blog...so do drop by!! Loved taking a summer walk with you in your garden. The heat didn't bother me a bit. You truly have a beautiful garden. very nice photo! reminds me of summer! birds, ponds, frogs, blue skies! Beautiful photos. I love summer happenings as well. I am ready for fall, though. 100 degree weather is getting a little rough. I love the sound of running water and I have always wanted a water feature in the garden. Your pond is so pretty and the garden looks lush! It has at least temporarily cooled off here in MIchigan a bit. I just got up and it is 58 outside and I think the high is supposed to be 80 today:>) Yay! You and your camera certainly did a great job in drawing me outside this morning to see your beauty. Outstanding pictures of well cared for grounds. I like the one of the summer sky and clouds. Beautiful post! Your pond is absolutely stunning!! I wish I had a big enough yard to have one in my yard!! This is such a lovely post...I can almost hear the clinking of ice cubes in our virtual glasses of lemonade. My favorite part is the wisteria reaching for the sun...simply lovely. Stay cool my friend and have a wonderful weekend. It is hot Stacey! It's looking really beautiful at your home. Love the pretty butterfly and the fish. Ahhhh, the water garden is perfection. :) I want a water feature so badly and can't seem to convince the Hubster. It has been so hot!! Everything is growing like a weed though...our grass has slowed down some so my hubbie doesn't have to mow as often. Your pond is so beautiful..I would love to have one but I'm deathly afraid of frogs...so I'll just admire yours! LOL Have a great weekend!! Your beautiful garden never ceases to amaze me. :) Thanks for the armchair tour. It's so much cooler in here! Thank you for the kind comments you left on my blog. I love to garden also and all the bright colors on your's make me happy. Oh, such pretty photos! On hot days I also need to get outdoors for a daily walk and also to check out our flowers. Beautiful photos! My favorite time of year is when the wisteria is in bloom...wish it lasted longer.